Follow our quick and easy steps to clean up your computer. Have you noticed problems with your computer — annoying pop-up windows, browser hijacks, erratic behavior, error messages, or just plain slow performance? You need to take steps to fix your computer before things get worse. If you wait until your computer crashes, or you receive the “blue screen of death”, it may be too late. We have known people that let their computers get in such disarray that they had to purchase new computers altogether! There are some simple things you can do to fix errors, eliminate conflicts, and tidy up your PC which can make it run as good as new! Along with our concise, easy to follow instructions, we also recommend a suite of powerful Free PC Cleaner programs that will rid your PC of errors and tidy-up the Operating System. Save on costly PC repairs – clean up your PC now! To start off, you should do a few quick things that may improve performance. First, Restart your computer. Also, you should not be leaving your computer on for weeks at a time, we highly recommend you perform a shutdown each night – this will cleanse your system and run diagnostics at the startup. If you start to feel your PC is performing slow and sluggish, and you haven’t shutdown or restarted in a long time – the first thing to do is perform a full restart. Can’t get your PC to boot up? Are you seeing too many errors on start up? Try starting up your PC in Safe Mode, then performing some of the clean up steps below. Next, go to your Control Panel and click on Add and Remove Programs – take a close look and see what programs have been installed on your computer – uninstall software that you do not use or that you did not install (spyware). Keep an eye on the size of your hard drive and how full it is. Typically, hard drives that are nearly full will not perform as efficiently as a hard drive that has more ample free space available. If you don’t need it, get rid of it! Before I install any new software programs, I always pause and think – do I really need to install this program? The more programs you install (and later uninstall), the more “clutter” accumulates in your PC’s registry – which can lead to reduced performance in the long run. Run a Hard Drive Defragmenter (Accessories — System Tools — Disk Defragmenter) – especially if you have not done so recently. A defragmenter is an application that reorganizes the data on your hard drive’s partitions in such a manner that the files are stored in as much contiguous space as possible. The defragmenter will search your hard drive partition and move data from one location to another location, rearranging the data so that it is stored in one contiguous piece, rather than being scattered throughout your hard drive. This allows programs to run more efficiently and data to be transferred quicker. If you have the time, we recommend also running a Disk Cleanup as well. For additional instructions on an advanced level of disk defrag, check out our Speed Up Your Slow PC section. Free up some space, perform these tasks regularly: Empty your recycle bin. Clear out your Temporary Internet Files and Cookies (Internet Explorer / Tools / Internet Options). Make sure your hard drive is not chock-full (i.e. 97% full) – the fuller your hard drive, the poorer your performance — you may need to delete unused files and even programs. The best thing to do is to keep programs that you don’t use regularly off of your computer. You may even need to buy an additional hard drive, if you cannot free-up enough space. If your computer’s hard drive has less than 10% free, you are in a critical situation and you must remove some files to clear out room on that drive. If you are using Windows Vista operating system, when you browse your hard drives after clicking on MY COMPUTER – a red bar will highlight your drive if it becomes dangerously full. In today’s digital age, more than likely, your PC’s hard drive is full of photos and videos. Obviously family photos and videos are treasured and should not be haphazardly deleted – however, we advocate archiving them to a secondary (external) hard drive in order to free up space on your PC – especially if you take a lot of photos! Visit our hard drive back-up solutions section for information on how to back-up your important files. A potent program called CCleaner is an easy way to clean up your computer and fix many conflicts and problems. CCleaner is an all-in-one program that allows you to uninstall unused software, clean out your temporary internet files and cache, and analyze your PC Registry. Also, speed up a slow computer by removing unnecessary items loading at startup. Another great free clean-up program is ATF Cleaner . This program cleans all user temp folders, Java cache, the Opera browser, cookies, history, download history, saved passwords and visited links. Often malware (harmful applications) are harbored in these temporary files. 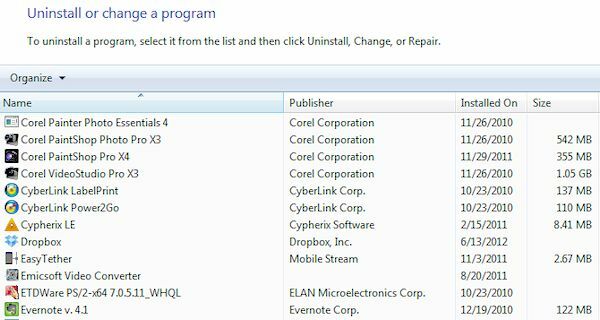 Also, if you have installed and uninstalled a lot of programs, consider cleaning out the registry. There are many free or cheap tools to clean up and remove old registry entries. Are you concerned about your online privacy? Check out our new section on how to best Protect your Privacy Online – with tips and advice on browsing, protecting and encrypting information on your computer. If you are using the Windows Vista operating system, you’ll find a slew of useful diagnostic tools and programs installed on your PC. Go to Programs >> Accessories >> System Tools (see below screen-shot). Here you will find tools such as Disk Cleanup (program that enables you to clear your PC of unnecessary files). Below this you will find Disk Defragmenter. Below that option is the System Information diagnostic program that allows you to analyze your performance and view what programs are loaded or executed at startup and you can also identify problems or system conflicts. Lastly is the System Restore option. This allows you to either set-up a new System Restore point or revert your system back to a previous System Restore point. Windows XP/Vista periodically records a snapshot of your computer. These snapshots are called restore points. You can use System Restore to remove any operating system changes that were made since the last time you remember your computer working correctly. System Restore does not affect your personal data files (such as documents, browsing history, photos, favorites, or email) so you won’t lose changes made to these files. System Restore can be used to restore you PC back to its state before you installed new software, or before you started tweaking its settings. If your PC is running the Windows Vista operating system, you may notice it running slower than other operating systems that you have used. Windows Vista tends to be a resource-hog and it’s fancy features tend to slow down and bog-down PCs. Read our article: How to Speed Up Windows Vista . Running other versions of the Windows Operating System? Check out our other helpful articles: Speed up Windows 7 and Speed up Windows XP . Want to remove some of your Startup items from initiating when you boot-up your computer? Startup programs are programs your Windows operating system automatically starts up when your computer boots up. These programs are started, then run in the background – often without you even knowing it. In addition to slowing down your computer’s boot up time significantly and draining your system resources as they run perpetually in the background, there are also many viruses, spyware, and malware that bury themselves into your PC and set themselves to start up automatically when Windows starts. Over time, your list of startup programs will grow and grow – eventually you may have dozens of programs and some malware starting up automatically (without your consent) when you computer boots up. This will place a serious drain on your system resources bogging down your computer on startup (ever wonder why it takes FOREVER to startup your PC?). Find out more ways to Speed Up Your Slow PC Startup. Take a look in your System Tray (lower right-hand corner of your screen) – is that area loaded with icons? If so, you may have a ton of programs and processes running in the background – each of them draining your PC’s precious computing resources. Remove the ones you don’t need! Remember, many of the items in your System Tray are laying dormant there but are still running in the background. You can remove many by simply right-clicking on that icon and selecting “Close” – however, make sure you verify that they are not simply being loaded back into your System Tray every time you startup your computer. So, which programs do you “kill” to prevent them from running on startup? Check out this handy online list of Startup Programs and Executables — compare the items on your Startup list and the programs in this online list, then remove the ones you don’t need. You can also check out this Startup Programs List to find out which are harmful and which are necessary. Over time, most people will end up with a large assortment of odds-and-ends in their System Tray. Many are installed in the background when you install new software (such as Yahoo Messenger). Most people think you need to tinker around with your computer’s registry to remove your Startup programs. This used to be the case before programs were created to do just that. Now any user can remove the startup programs they don’t need without having to learn complicated Regedit functions. It’s easy – simply use the CCleaner program to help you control your startup programs or click on Start > Run > msconfig to control your startup items manually. If you see random windows popping-up from your internet browser, or you feel you have lost control of your internet browser and it is directing you to surreptitious websites, you may be experiencing a Browser Hijack. A Browser Hijack is a serious and time-consuming problem and should be treated seriously. This happens when malware is inadvertently loaded on your PC causing a change to your internet browser. This usually causes your internet browser to force pages to “pop up” and in many cases try to sell you products to fix your infected computer – a kind of internet extortion scheme. A Browser Hijack can be initiated when you visit a “questionable” website on the internet, or when downloading files from the internet or via a peer-to-peer network much in the same manner as how viruses are delivered. Check out our instructions on how to eliminate a Browser Hijack . The last quick fix that you should try – if your Operating System is Windows Vista or Windows 7, is to Restore your Operating System to an earlier date. Both Vista and Windows 7 have the ability to automatically and manually set “Restore Points” – these are placeholders in time where your PC will “remember” the system settings and allow you to revert your Operating System to an earlier state – kind of like jumping in a time machine and taking your PC’s Operating System back to an earlier date – hopefully before you started having problems. To perform this function properly, you will need to regularly set Restore Points so that you have references to restore your system. Make it a point to set Restore Points before installing any new software or performing any widespread changes or upgrades to your software. Think you need to re-install your entire Operating System? Check out our article on how to re-install Windows. Slow PC or Slow Internet? Is your internet connection bogged-down? Wondering how fast you are actually connecting? Gage how fast you are connected: test your internet connection speed. This troubleshooting is particularly useful to perform prior to calling your Internet Service Provider (ISP) for help – gauge your connection speed yourself that way when you call your ISP you can tell them exactly how slow you are connecting. If your internet connection is indeed slow, there are a few things you can do to speed up your slow internet connection. Once you have taken care of these Quick Fix items, it’s time to move on to finding and eliminating spyware on your PC and a complete and thorough virus scan. Once you are finished cleaning up your computer and fixing the conflicts and problems, you must take precautions against these problems popping up again in the future. If you are beginning to have problems with your computer, you should consider taking the time to set up a good backup plan for your precious files and learn more about how to protect your privacy when you are online . When your privacy is better protected, you increase your safety while using information-sensitive applications such as Quicken.